This page is an addition to the comprehensive housing affordability analysis we already cover at interest.co.nz. The house-price-to-income multiple is a simplified, yet internationally recognised measure of housing affordability. It is covered in Agenda 21, Chapter 7 of the United Nations Framework and it is defined as the ratio between median house price and median annual household income, otherwise known as the median multiple. The World Bank also says this ratio is "possibly the most important summary measure of housing market performance, indicating not only the degree to which housing is affordable by the population, but also the presence of market distortions". Based on this official work, it seems to have become accepted that a median multiple of 3.0 times or less is a very good marker for housing affordability. Much of the work in support of the 3x standard is based on US research on the US housing market. Median house prices are as reported by the Real Estate Institute of New Zealand. Although the REINZ series is more volatile than the QV equivalent, there is a highly positive correlation between the two series. The REINZ series is more current and offers an earlier indication of market trends. Unfortunately, the new RBNZ-REINZ stratified house price index series does not have enough detail to be used in this analysis. The household income for a standard household is made from one full time male median income, 50% of one female median income, both in the 30-34 age range, plus the Working For Families income support they are entitled to receive under that program. This standardised household is assumed to have one 5 year old child. Incomes are before tax and retrieved from the Statistics NZ / IRD LEEDS income series. LEEDS data are subject to revision. Work continues to more exactly match median incomes to local authority boundaries. - we use income from the very detailed IRD-based LEEDS series which is for primary wage and salary income, plus W-F-F benefits paid, whereas Demographia use income data based on the last census (2005) for all age-groups and have applied factor increases to account for the later time period. The census income data includes income elements from all sources (wages, salaries, interest, dividends, benefits, self-employment, partnerships, foreign, etc). No reader should rely on the contents of this report for making a specific investment or purchase decision. The information in this report is supplied strictly on the basis that only overall market trends are being reported on, and that all data, conclusions and opinions expressed are provisional and subject to revision. If you are making a specific investment or purchase decision, you are strongly advised to seek independent advice from a qualified professional you trust. The conditions and disclaimers set out at https://www.interest.co.nz/terms-conditions are applicable to this report as well. This report is made available on these terms only, and neither JDJL Limited nor www.interest.co.nz will accept any responsibility for any actions taken on the basis of information in this report, nor for any error in or omission from this report. The 'Christchurch' chart will be drawn here. Too old for a mortgage at 40. Too worried about negative equity and its consequences..
Too worried about where property is going. Even an adviser rents as Houses over cooked. We can work past our Prime. David & team - ever consider converting this page into one of your charts? Where you can select NZ as a whole or each city, and graph the multiples over time? Would be very neat. *my approx calcs, calculated based on the NZ total data and the data for the towns and cities you listed. Neither of these are far off the housing affordability benchmark MM of 3.0x or less, a rather different housing affordability story for NZ Inc (ex-Auck) than when the Auckland-inclusive stat is used. 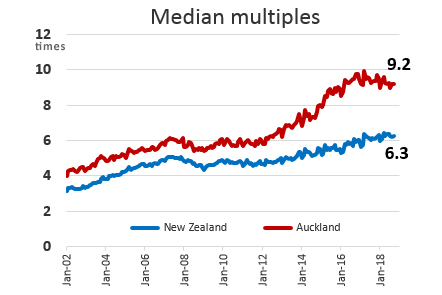 The single NZ total MM you (and other media) currently provide is so significantly influenced by the large population MM 'outlier' of Auckland metro that it doesn't give a useful picture for housing affordability - on average - across the rest of NZ. Sure Queenstown is also an outlier on the MM front but its small population means its impact on the NZ total MM is negligible. Oh my Gosh , those public servants are the best paid in the land down in Wellington !